Time to finish off the two-part Lone Ranger lead-up. 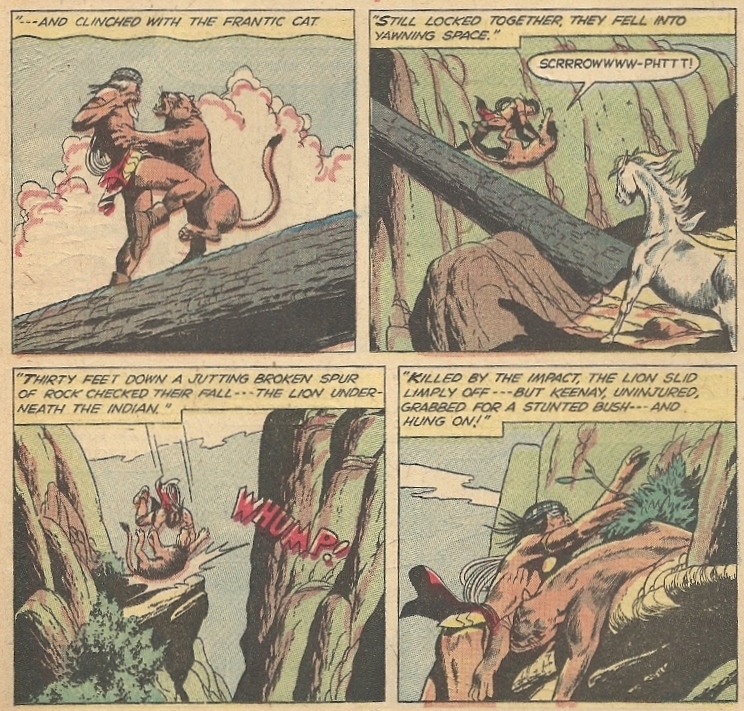 We’ve already taken a glance at Tonto’s solo comic, and today we’ll be looking at that other co-star of innumerable Lone Ranger stories. And really, everyone knows who the real headliner of the whole shebang was, who really drew young boys into the Western do-goodery of Kemo Sabe: Silver. 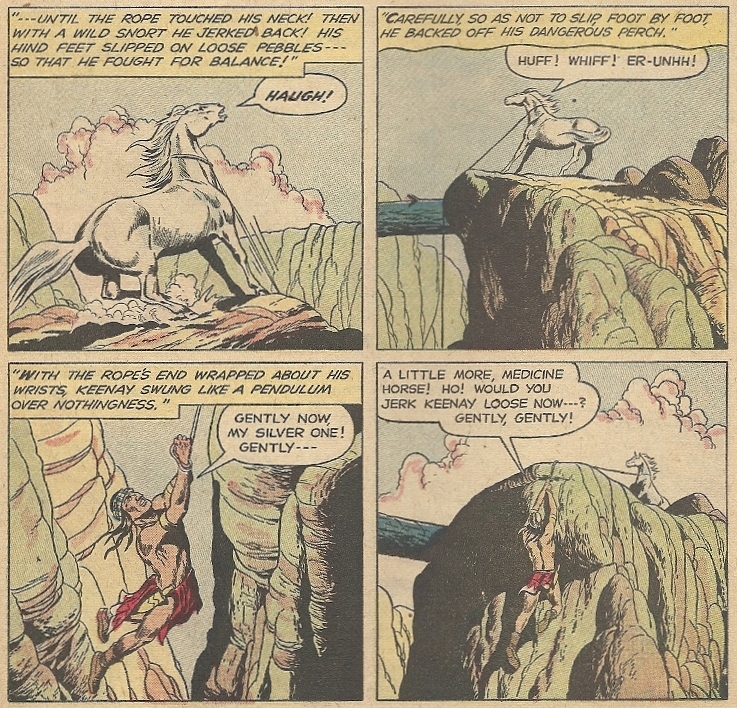 Yes, the Lone Ranger’s hyper-smart horse had his own book too, though because — apart from freaks like Mister Ed — horses can’t talk, Silver’s owner has a presence here, both as framing device and narrator. But make no mistake, Silver is the star of the show/comic/whatever. Did you ever watch any of those Incredible Journey movies from Disney, the ones with live-action cute animals teaming up and having themselves an adventure, with a narrator calling the action? 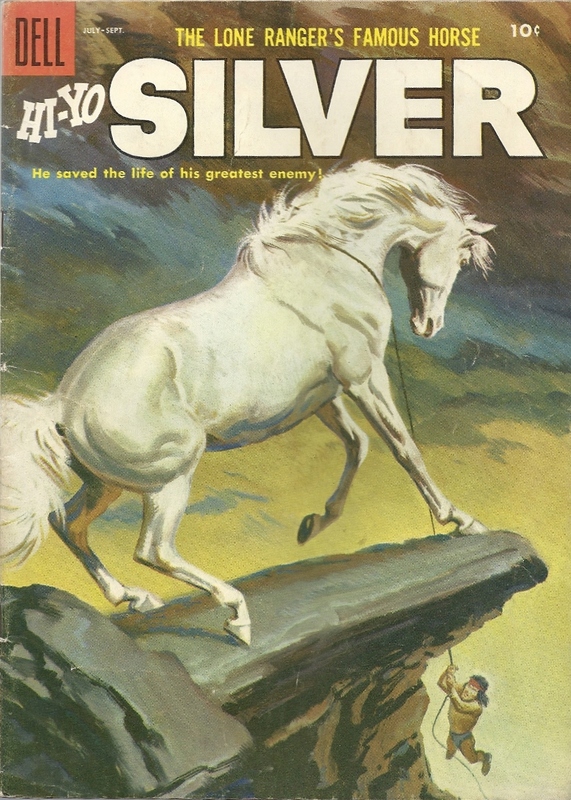 The Silver stories are a lot like that, with the Lone Ranger filling the yakety-yak role. Predictable. Fine and dandy. But the odd thing is, the Ranger is narrating the solo exploits of Silver before he became the most famous horse in all the West, when he was wild and free and, hence, before the two became acquainted. This begs the question(s): How did the Lone Ranger learn of these exploits? Is he making them up? Can he communicate with Silver like Han Solo does with Chewbacca, understanding the grunts and whinnies that leave others dumbfounded? Is it a psychic bond? Were these tales relayed through a long series of yes or no questions and hooves stomped one or two times? I could never even get my dog to fetch — he’d just take whatever I threw, hunker down and gnaw on it. I’m therefore quite impressed by Silver’s patient resourcefulness. Hi-Yo indeed. There’s something compelling about drawings of horses in motion. Leonardo da Vinci understood it, and his sketches and studies remain gold standards to this day, echoing into the horse art you see above (the artist is uncredited). Lesson: Horses never lose their appeal for man. The ugliest horse is still more appealing than the most beautiful specimen of many other animals. So if you have a famous horse with a name, you have a book that will sell. And a horse with a name that will do battle with a thief and then save the thief’s life? Well, look out. We’ll see in a couple of months whether the new Silver can live up to the heroism of this comic forbear. It’s a tall order. ← Where else could you find Superman, the Lone Ranger, Space Ghost and Frankenstein Jr. together but 1960s CBS Saturday Mornings? The Hi Yo Silver covers were painted by Sam Savitt; the interiors were drawn by Tom Gill and the stories were penned mostly by Gaylord Dubois.